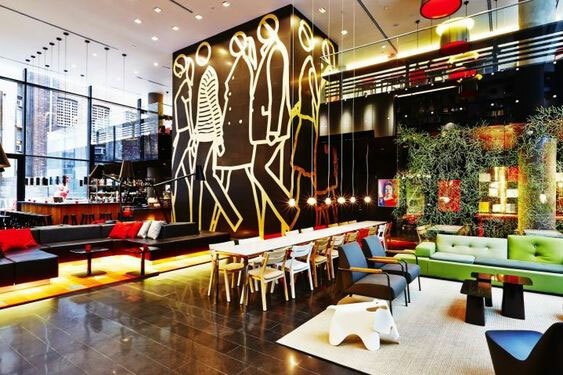 When it comes to unique wall art that makes a statement, hospitality interior design offers a perfect background for the talented artist, for a few reasons. First, due to their size, large lobbies are an ideal place for ample artistic visions. Second, hospitality wall art has the chance to be slowly taken in and appreciated by visitors. 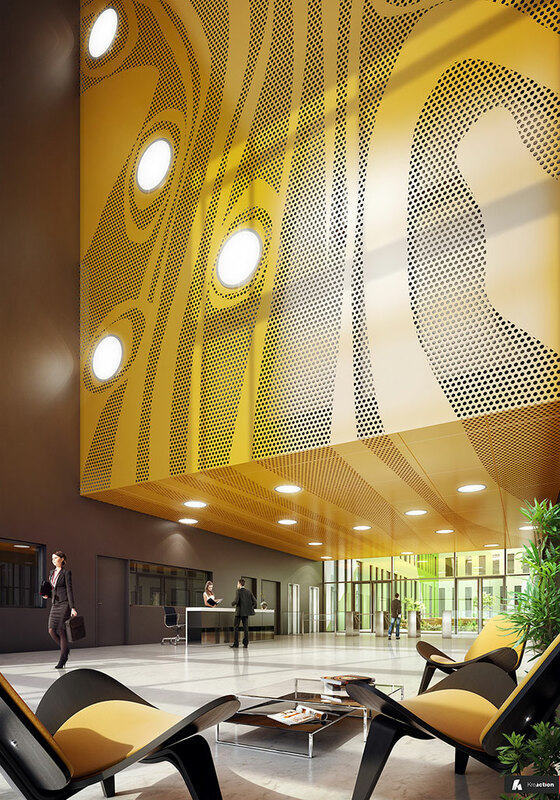 Such large artworks and displays also give a space some visual zest and define its character. 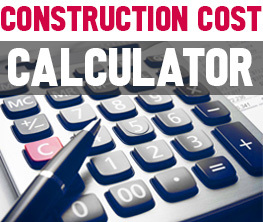 Here are a few examples that make it all about scale and color. 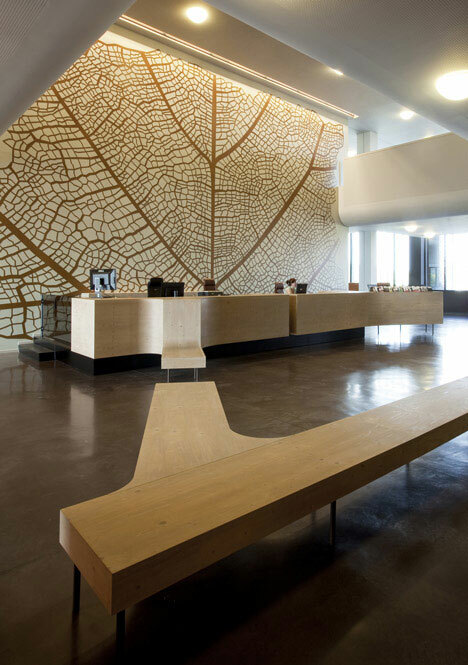 With the entire design making hazelnut trees part of its artistic inspiration, the wall behind the reception desk of a multi-functional building in Hasselt, Belgium, continues on the same theme. A veined leaf extends all over the wall, giving it color, contrast and texture. Here is another way to use the leaf motif to create hospitality wall art. 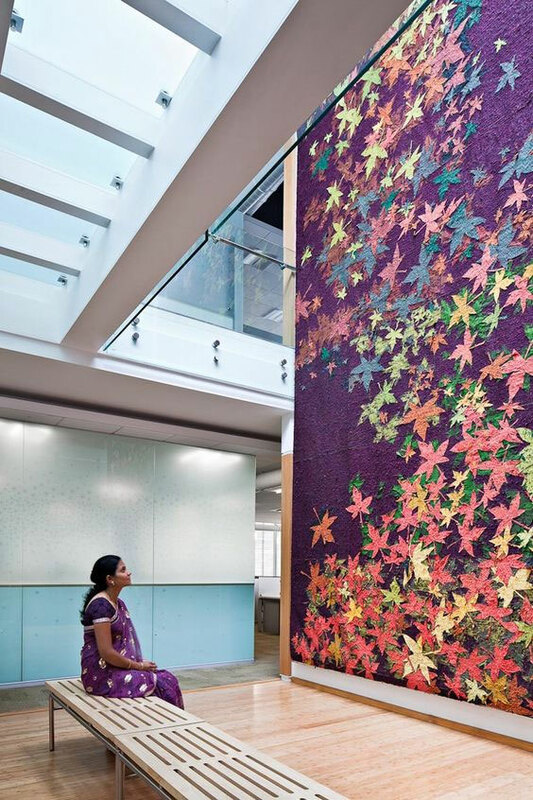 Regardless of the materials used, nature-inspired artwork has a calming effect and is extremely versatile. Crossing into 3-D art, cut-out displays never fail to impress. It is because of the mix of positive and negative spaces and the attention that they bring to the material used. When done on a large scale and combined with modern lines and good lighting, cut-out art can easily become the visual focus of the entire space. The large canvas of a long wall should never be wasted. The Hotel Fox in Copenhagen, Denmark, worked with 21 young artists that separately decorated the rooms according to their own personal tastes. The lobby also got the artistic treatment, with wall graphics done in blue, green and purple shades. For a more dynamic type of hospitality wall art, using stylized oversize human figures with simple yet contrasting colors and a good placement of light can make a powerful statement. Wall artwork does not have to be restricted to lobbies. 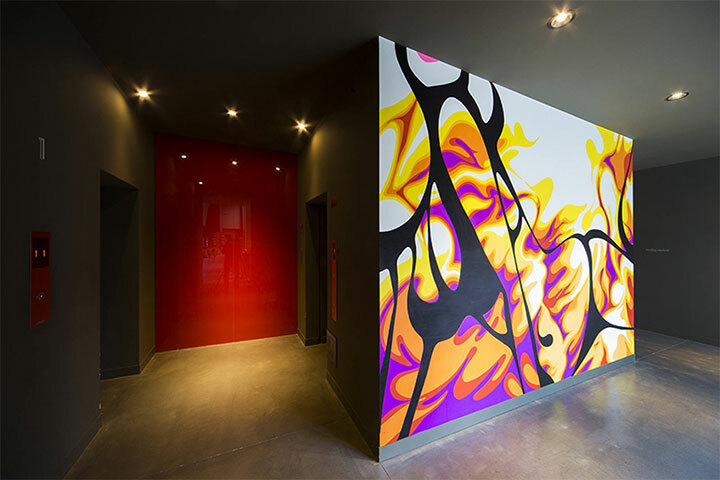 All throughout the hotel, walls painted in colorful tones make the space less impersonal and more welcoming. This vibrant wall art, part of Tokyo’s Shinjuku Granbell Hotel interior design, brings light into a dark corner and makes this area look warm and cozy rather than somber.